f.l. DGK-President Prof. Dr. Dr. h.c. Gerd Heusch, Ursula Ida Lapp, award recipient Dr. Rory R. Koenen, Congress-President Prof. Dr. Helmut Drexler and Siegbert Lapp. In 1987, Oskar Lapp died following a heart attack. The sudden death of the company founder and father of three was a tragic event for the entire family. It is also a fate that many people continue to suffer today. That is why research into heart disease is so important to the Lapp family. With this in mind, and to honour the memory of Oskar Lapp far beyond the company, the family founded the Oskar Lapp Foundation in 1992. The foundation supports and encourages young scientists to showcase their work in cardiac research through a scientific competition. It awards a prize of 12,000 euros to the winner. 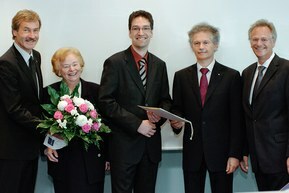 The prize is awarded annually by the German Cardiac Society (DGK). The Oskar Lapp Research Prize is the DGK’s first prize for young scientists that is not limited to a specific field. It aims to further encourage young scientists to work in cardiac research to expand the horizons of cardiology. The Oskar Lapp Research Prize is presented annually, while the Oskar Lapp Grant, which provides up to 20,000 euros for equipment, is awarded every two years.